An excellent cordless chainsaw that is both reliable and affordable. The GreenWorks 20312 is one of the most popular cordless chainsaws on the market, and for good reason. It’s an absolute bargain when you consider everything you get. It’s a 40V cordless chainsaw that comes with 4 Ah lithium-ion battery with enough power for about 150 cuts on a single charge. It’s lightweight (10.36 lbs) and requires no maintenance, so it’s perfect for homeowners who need to do small jobs around the yard, especially felling small trees (up to 30″) and pruning trees. We’ll discuss the GreenWorks 20312 in detail later on in the article, as well as many other fantastic chainsaws that are considered a great value — meaning, you get a lot of chainsaw for your money. But first, let’s talk about chainsaws in general. There’s a lot to learn before making a decision on which chainsaw to buy. Sneak Peek at the GreenWorks 20312 in action. Chainsaws are one of the signature power tools which every homeowner or professional arborist must not only own, but also learn how to master. They have been around, in concept, for roughly 200 years, although the chainsaw as you are probably picturing it, came into existence about 100 years ago – just shortly after World War I. Chainsaws are portable, efficient, handy, and rather economical while still packing a powerful punch. As such, these instruments should be thoroughly understood and respected in their capabilities – which is why we prepared this comprehensive buying guide for you. Just keep reading and we’ll make sure to give you all of the most relevant pieces of information for a smart and worthy purchase. As our initial kick-off, we’ll talk a bit about the history and evolution of chainsaws as well as their way to becoming one of the most procured tools in the market – this is important because it will lead us to the most respected and reliable brands. After we get that covered, we can begin discussing the different types of chainsaws available – here we’ll examine their construction, power sources, sizing, standard features, most common uses, and unique pros and cons for each class. At the very beginning, we mentioned the importance of mastering the chainsaw to get the best value out of it in a safe and optimal environment. Here we’ll expand a little bit about this subject by exploring one of the most common applications for this device – tree felling. Much like mapping a demolition site, downing trees to the ground requires a careful setup to avoid accidents and injuries, so we’ll cover everything you need to know from scratch. As we wrap this segment up, we’ll detail a list of tips and regulations when using a chainsaw – everything from approved felling techniques, preventive maintenance, safety measures, and recommended PPE (personal protective equipment). Latest battery chainsaw from GreenWorks. Much more power than the 20312. Last, but not least, no buying guide would be whole without addressing the different brands and models available in the market. Here is one sneak peak, though, when it comes to chainsaws you shouldn’t bargain – after all, your physical integrity and that of those around you are at stake. We’ll suggest only the most reliable brands with a proven history of consistency and flawless product quality. We understand that not one single product will be a perfect fit for everyone, which is why our curtain call will be all about the specific models — their features, pros, cons, best applications, and recommendations. Once you’re through, you’ll be able to pinpoint the best chainsaw for your needs in just a few steps. So, let’s begin. The exact origin and circumstances of the first chainsaw-like device are still in an open field for debate. Some people argue that we owe it to John Aitken, a Scottish doctor who designed a prototype in 1783 with the sole purpose of performing symphysiotomies – up until the early 19th century, they were a common surgical procedure to widen the pelvis in cases of complicated childbirth labor. In 1790, another Scot by the name of James Jeffray came up with his own version to cut through diseased bone tissue. A few decades later, Bernhard Heine, a German orthopedist, constructed the first osteotome in 1830 – a mechanical instrument designed to cut through bone. It worked by rotating a chain with cutting teeth, inclined at a certain angle, with a sprocket wheel handle. Even though these instruments were avant-garde, to say the least, they became widely accepted in the medical industry for the greater part of the 19th century. Up until that moment, no one dared to imagine using them in applications other than surgical procedures. However, this all changed in the dawn of the 20th century when Canadian James Shand created and patented the first ever portable chainsaw, in 1918, and while he himself did not go all the way through the production process, he most certainly paved the way for three of the most important contributors in the industry – Joseph Buford Cox, Andreas Stihl, and Emil Lerp. In 1947, Cox and his wife, Alice, went on to found The Oregon Saw Chain Co., currently known as Blount International, Inc. The Swiss, Andreas Stihl (as the name probably rings a familiar bell) founded the homonym company in 1926. They made the first ever electric chainsaw during that same year, developed a gas-powered design in 1929, and in 1931, became the first company to export their products to both the American and Russian markets. Lerp, the founder of Dolmar, created the world’s first gas-powered chainsaw back in 1927 – in 1991, Dolmar was acquired by Japanese Titan, Makita. Both Cox and Stihl made remarkable advances in the chainsaw industry, and they’re also relevant to us because most designs today employ either Cox’s or Stihl’s construction patents – more about this a little further down. Just as most commercial power tools, when it comes to chainsaws we also have three available power sources – gas-powered combustion engines, corded-electric, and cordless electric with batteries. Gas-powered builds usually feature a two-stroke engine, which means they don’t have a separate oil reservoir, so you have to either mix oil directly in the fuel tank at the right ratio or buy premixed fuel. Most modern combustion engines have been doing their homework and are much more efficient today than they were in the past. This build is by far, the one with the longest running time and lowest running costs. On the downside, there’s the carbon fingerprint issue, the louder-than-average noise emission levels, and slightly average heavier weight. Electric builds divide into corded and cordless editions. 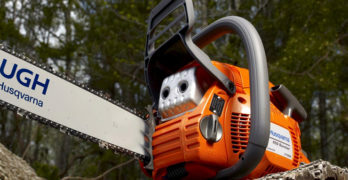 Corded-electric chainsaws provide a great value for your investment provided that you don’t need to venture too deep into thick forests — as in further than 100-feet from an outlet, which is the longest extension cord available in the commercial market. Most of the times, these builds are also the lightest of the three, and since they do not release any carbon byproducts and because they are not as loud as gas-powered ones, you can safely use them indoors — after all, tree felling is just one of the many applications for an electric chainsaw. Battery-powered devices also bring portability to the table, along with low noise emission levels and zero air pollution. More often than not, you’ll find them in the middle to upper half of the price range and they are just slightly heavier than a corded model, because of the attached battery. There are only two major downsides you should consider about this build — battery duration per full charge and limited power. Depending on the specific model and the amperage of the rechargeable battery, you’ll an average running time of roughly one to two hours. Secondly, battery-powered chainsaws might not be the best choice for thicker and older hardwood trees – we’ll expand a little bit more about tree density on another segment. Brushless motor, powered with a 40V Lithium 4 Ah battery (or 6 Ah). Ultimately, there is no perfect build for a chainsaw. It really comes down to the type of task you have at hand, and the type of wood you’re dealing with. For example, for simple trimming and pruning, you can choose a light-duty, electric chainsaw. If, however, you’re a professional arborist who is consistently dealing with thicker hardwood trees above ground, then you might want to consider a heavy-duty, top-handle gas-powered chainsaw like the Tanaka TCS33EDTP/14. Lastly, if you’re a homeowner, or farmer, with small-to-medium sized lands, you can either choose a light-duty electric model or a medium-duty gas-powered chainsaw. When in doubt, you can always go for a slightly superior build. In the end, it’s better to pay a little more for a power tool you can use under any circumstances. As we mentioned before, gas-powered chainsaws usually feature a two-stroke engine, so always double-check with the manufacturer’s instructions for fuel and oil types, as well as the recommended ratio. Filling the tank with incompatible fluids can damage the chainsaw’s integrity and shorten its lifespan. In the case of electric chainsaws, both corded and cordless builds, the internal engine is usually lubricated for life. Now it’s time to talk about the chain, and one small detail to consider is that in all versions, there is a separate oil reservoir for lubricating the chain itself, and as a rule of thumb, every time you refill the fuel tank you should also refill the chain oil one, even if it doesn’t seem to need it. A good chainsaw shares one similar trait with a good butcher’s knife, both should stay razor sharp, or they will under-perform, and possible pose risks to the operator. Most chainsaws can become blunt if they get in touch with soil, metals, stones, and other rigid surfaces. So, if you’re anticipating you’ll encounter these materials regularly – or if you specifically intend to cut through metal and stones — then your go-to choice should be a chainsaw with either a tungsten or diamond chain. However, if your chain does become dull and blunt, you can always resharpen it or, if you feel like avoiding the hassles, buy a replacement chain to keep on working since they’re also rather inexpensive. Modern chainsaws are getting much more versatile than ever before. However, they’re still the signature tool for tree felling, and the vast majority of buyers are looking to get one for this purpose – whether they’re homeowners of professional fellers. That’s why we thought about compiling a little checklist; so that newcomers can learn everything about safely cutting down a tree, and so that professionals can optimize their procedures. The first thing you want to do is to scan the surroundings for possible obstacles and safety hazards – the idea is for the tree to fall freely and unobstructed, in a direction where it won’t cause any damage. The tree you want to cut down will have a lean (the direction it would want to follow when falling down) so, the next step is to acquire that lean information and use it to manipulate the falling. The easiest way to do it is to grab a stick, or maybe a wooden ax, roughly the size of your arm. Hold the stick at the base with your arm fully extended, kind of like holding a torch. Now you need to create some perspective because you want the stick to appear as big as the tree. Walk away from the tree until the stick you’re holding looks like an exact representation of the tree – walk forward and backward and lean the stick slightly to the sides until it’s perfect. Once you’re there, it means you have found the exact spot where the tree would fall. Before you start cutting the tree, you should plan your escape route. From where you’re standing with your chainsaw, it covers a stretch of 15-feet at a 45-degree angle away from the tree – clear this area completely from shrubs, rocks, and other obstacles. Now you need to do the hinge calculation, which is roughly 10 percent of the tree’s DBH (its diameter at 4.5-feet from the ground) – so if the tree measures 15 inches in diameter, your hinge should be about 1.5 inches. There are many chainsaw techniques, and we won’t cover them in detail because they’re more a matter of personal style. For this guide, we’ll be using a 70-degree hinge cut at about 80 percent of the tree’s DBH – 12-feet for a tree with 15-feet in diameter. While you’re doing the initial cut, it’s critical to lock your eyes on the exact direction you want the tree to fall, do not look at the chainsaw because it will most likely change the directed pattern and possibly damage structures and harm other people. Now the last step is to cut the hinge with the chainsaw through the tree, at about 10 percent of the DBH. You want to make a straight and uniform incision, before moving the chainsaw to the back of the tree. Once the hinge cut is complete, it will be the last chance to double-check your surroundings. If all is clear and it’s safe to proceed, move to the back of the tree, make the final cut, and retreat to your escape route. If you followed all the items in this checklist, then the tree will fall in the exact direction you planned. However, sometimes you won’t feel confident enough to proceed on your own, even if you mark all the items in this checklist. If that’s the case, don’t hesitate and call a professional arborist. When your physical integrity and that of those around you is at stake, it’s always better to be safe than sorry. Fantastic chainsaw in a complete package. Exceptional value. Brushless Motor delivers up to 30% more torque for superior cutting performance. High performance 40V G-Max Lithium-Ion battery delivers fade-free power with no memory loss after charging. Robust 16 in. steel chain and bar with tool-less chain tensioning offers ease of use while delivering the highest cutting performance. 3/8 in. chain pitch delivers the right amount of capabilities to get those limbs trimmed and cut with minimal kickback. Includes: chain brake, quick-release trigger for safety, push-button start. ✓ View or download the MANUAL for the GreenWorks 20312. There are several reasons why the GreenWorks 20312 stands in the spotlight of our buying guide. With a 40V, 4.0Ah, Lithium-Ion, rechargeable battery, you can expect to make up to 150 cuts with a single charge – this battery is also compatible with all GreenWorks G-MAX 40V power tools and is fully charged back up in just 2 hours. Very easy to use. Ideal for light-duty cutting tasks around the yard. This GreenWorks 20312 chainsaw comes with a high-efficiency brushless engine for up to 30 percent more torque, and at least 70 percent less vibration, for an optimal user experience. Like all electric models, the engine is lubricated for life and has an automatic start. The bar is a 16-inch, Oregon 164MLEA041, and the chain is also an Oregon 90PX056X, which comes equipped with a built-in chain brake, low kickback, and an automatic chain tension adjustment. The handle is not equipped with an anti-vibration feature, but the X-Torq engine makes up for it. This chainsaw is also quite light, weighing only 10.4 pounds. GreenWorks offers a standard four-year warranty, just like with all their power tools. Probably the most popular electric chainsaw — but you have to manage the cord. Tool-free tensioning system prevents over-tightening. Chain brake for extra protection and safety. Rubberized rear handle is comfortable to hold and easy to grip. Comes with a 3/8″ pitch reduced kickback chain. The WORX WG303.1 chainsaw packs a lot of versatility for an electric device. It runs at a voltage of 120V and a 60Hz frequency – built for the American market. With 14.5A you can expect an average running wattage of 1.74kW/h – a bit more than an electric stove and less than a large air conditioning unit. This chainsaw fits in the light-duty division, with a 16-inch bar and a maximum chain speed of 12m/s (about 27mph). The oil tank capacity is 6.75 fluid ounces, roughly 200ml, and just like all electric models, it’s lubricated for life. The chain build is an ES:91VG with 57 links, the bar is an ES:160SDEA041, and it has a total weight of approximately 11 pounds. This chainsaw features a 3.5hp engine, an anti-vibration handle, a built-in chain brake, and a three-year standard warranty. The WORX WG303.1 comes with a 2-feet cord, so make sure to buy a 12-gauge, 100-feet extension cord for an optimal performance. Should you prefer a chain saw for infrequent cutting of fallen branches and other light work, consider a corded-electric saw such as the $100 Worx WG303.1. In addition to being faster and better balanced than its larger 18-inch sibling, the Worx WG304.1, this saw had cutting speed on a par with the fastest light-duty gas saws we tested. Other pluses include a chain brake, tool-free chain adjustment, and a durable bar cover for safe storage. But as with other plug-in saws, you’ll need to work within 100 feet of an outlet. One caveat: There’s no vibration dampening. A great compact chainsaw if you don’t mind dealing with electric cords. ✓ View or download the MANUAL or PARTS LIST Makita UC4051A. Even though the Makita UC4051A also features a 16-inch bar, we want to consider it as a medium-duty chainsaw. The chain is a 91PX with 56 drive links and a maximum running speed of 14.5m/s, or about 32mph. With a total weight of 12.3 pounds, this product is both light and powerful, while also being energy-efficient with a 14.5A motor at 120V – which turns into an average running power demand of 1.74kW/h. This is a professional quality electric chainsaw and worth the extra cost. This chainsaw features a rubberized, anti-vibration grip handle for additional comfort. The engine has a built-in soft start with an electric chain brake and an automatic oiler for optimal productivity. While it’s also possible to couple it with a 100-feet extension cord, Makita recommends a maximum length of 50-feet with a 12-gauge specification, for safety measures. The UC4051A comes with a one-year warranty and, just like any electric model, it has zero carbon emissions and reduced maintenance tasks. Same features as the Makita UC4051A — but with a 14″ bar & chain. Learn more about these Makita saws by reading our comprehensive article on Makita Electric Chainsaws. Designed for pruning branches and cutting fallen limbs after a storm. ✓ View or download the MANUAL for the LCS1240. Our first battery-powered chainsaw review features the Black & Decker LCS1240, which falls under the light-duty division with its 12-inch bar. This manufacturer has a very handy feature in the swappable batteries – what this means is that you can swap batteries among the different B&D tools and keep on working. In this case, this product is part of the 40V Max Outdoor System, with a 2.0Ah Lithium-Ion Rechargeable Battery, which holds a full charge for up to 18 months, and can cut through 60 4×4 pine lumbers with a full charge. Great for small jobs around the yard. The LCS1240 comes with an automatic oiling system at the chain, for constant and optimal performance, and it also features a tool-free chain tensioning for smooth tunings. Since it’s a light-duty model, it’s ideal for cutting fallen branches, or pruning trees, with a built-in, low kickback blade. Additionally, this product doesn’t have an anti-vibration handle, nor does it have a chain brake. However, it’s very lightweight, at only 10.4 pounds and it also comes with a standard three-year warranty. Easy to keep the chain tight with the tool-free tensioner. Can replace a light-duty gas chainsaw. Great power. Efficient brushless motor running at 6300RPM. 56V EGO Power+ system. Compatible with all of their tools in the series. Up to 100 Cuts per charge. 14″ Oregon bar and chain. Chain kickback brake for your personal safety. ✓ View or download the MANUAL for the EGO Power+ chainsaw. The Ego Power+ CS1403 is here to prove a point, battery-powered chainsaws can be powerful, too. Featuring a high-efficiency brushless engine at 6,300 RPM, for smoother cuts, it comes with a 56V, 2.5 Ah Arc-Lithium rechargeable battery, which is also compatible with all Ego Power+ products and battery chargers. Don’t worry about those occasional drizzles and sprinkles, this chainsaw is built for tough weather conditions. An innovative 56V battery system. The CS1403 comes with a 14-inch bar, weighs only 13.4 pounds, and has an oil tank capacity of 5 fluid ounces, roughly 150ml. The bar is an Oregon 144MLEA041, and the chain is also an Oregon 90PX052X. While it doesn’t feature an anti-vibration grip, it does come with a chain kickback brake, a chain tension adjustment, an oil inspection window, and a battery charge indicator. Like all Ego Power+ tools, this chainsaw has a five-year user warranty. Powerful and well-balanced. Ideal for experienced chainsaw users. Felling marks for correct felling direction. Easy to maintain with snap locked cylinder cover. Maximum durability for tough applications. LowVib sparing the user’s arms and hands. Smart Start for easy starting. Fuel pump for easy starting. Increased safety, inertia activated chain brake. ✓ View or download the MANUAL or FEATURE LIST for the Husqvarna 450. The Husqvarna 450 features a 50.2cc, 3.2hp, 9,000 RPM, CARB-compliant, X-Torq engine. This motor packs quite a punch while still being relatively eco-friendly, reducing carbon emission by up to 60 percent, and optimizing fuel consumption by at least 30 percent. It comes with a fuel tank capacity of 15.2 fluid ounces and an average fuel consumption of 504g/kWh. With an 18-inch bar, this chainsaw falls under the heavy-duty category, but it’s still a lightweight model, with just 10.8 pounds. Husqvarna quality is worth the money you invest. Will last you for many years. Husqvarna invests a lot in comfort and safety features. In this chainsaw, you will find a chain brake activated by inertia – whenever it finds a very abrupt change in direction or a sudden stop, it will activate the brake to prevent severe injuries. A SmartStart reduces the effort required to kickstart the machine, LowVib minimizes vibration for decreased fatigue and optimal run-time performance, and the visible fuel level keeps you informed, at all times. The 450 comes with a centrifugal air cleaning system which removes dust and larger particles away from the air filter, which enhances the total up-time. While this chainsaw is very fuel-efficient, it has moderate noise emission levels at approximately 115dB – more than enough to warrant the use of protective earmuffs. All chainsaw operators should always respect the full power these tools can deliver, and sometimes, even when everything seems to be in order with your equipment, there are still several outer variables to take into consideration as well. For a little perspective on this matter, here are some hard pieces of evidence gathered by the United States Occupational Safety and Health Administration (OSHA). Two hundred and forty-three. That’s the number of work-related fatalities registered in the United States alone, involving chainsaws, in the year 2012. You might be surprised about the causes because not even half of them are strictly connected to the equipment. The four major ones are struck-by incidents (getting hit by falling trees, branches, or running equipment), caught-in incidents (getting caught by a running motorized equipment), falling incidents, and electrocution by overhead power lines. We can all agree that life is simply priceless. But non-lethal chainsaw injuries can also seriously impair the worker’s quality of life. According to the latest data gathered in 1999 by the United States Consumer Product Safety Commission, there are some alarming statistics as well. That year alone, roughly 28,500 injuries were reported involving the use of a chainsaw – being 36 percent of those injuries sustained in the legs and knees. An average chainsaw flesh-injury requires about 110 stitches, equaling to an insurance cost of roughly $12,000 per worker – and about $350 million worth of medical bills. These injuries require four weeks of recovery time, to say the least, which raises compensation expenses to the stunning figure of $125 million. However, PPE implementation in the workplace can reduce these injuries by 75 percent. Helmets: To prevent head injuries from falling objects, such as dead branches, and also to minimize the risks in case of a chainsaw kickback. Helmet, adjustable/removable earmuffs, plastic visor, and mesh visor. Goggles: To stop those tiny wooden chips from damaging the eyes. A well-maintained chainsaw will produce little to no sawdust. However, the use of goggles or protective visors is still mandatory. Acoustic Earmuffs: Since most chainsaws are louder than 85dB, operators must wear these ear defenders, as regulated by OSHA. 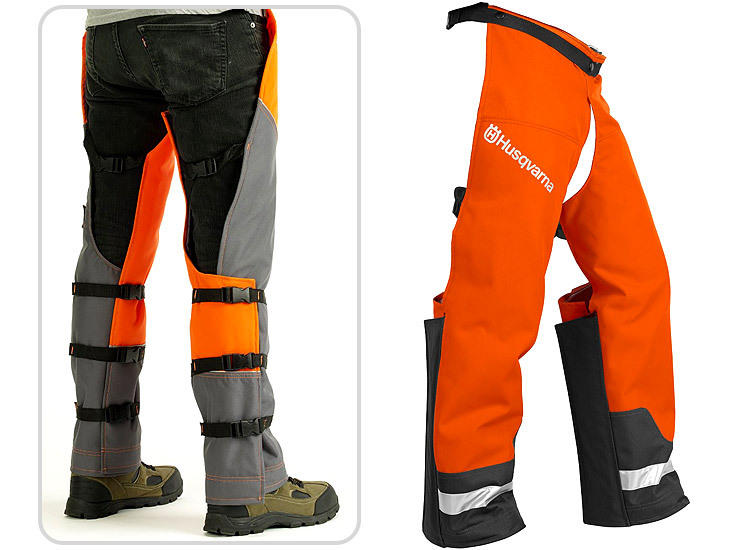 Protective Pants And Jackets: Severe leg injuries are, by far, the most common scenario when operating a chainsaw without PPE. Pants and jackets divide into classes and types – how fast a chain speed it can endure, and whether it protects the front of the fabric only or all-around. Protective pieces of clothing usually feature layers of Kevlar, ballistic nylon, or polyester. Adjustable waist size to 42 inches. Please practice safety at all times. Class 0, up to 36mph. Class 1, up to 45mph. Class 2, up to 54mph. Class 3, up to 63mph. Type A for frontal protection only. Type C for full protection. Gloves: They should have the same protection rating as that of pants and jackets, on the back of the gloves, while still being light and flexible enough on the front. You should always wear anti-vibration gloves when using a chainsaw. Boots: They are essentially steel-toe boots with layers of protective fabric on the frontal surface. High quality safety kit for homeowners. Anti-Vibration: This feature reduces fatigue and makes the job much more comfortable, especially for long shifts. Spring-Assisted Start: For gas-powered chainsaws, it reduces the effort required to kickstart the device. Automatic Oiler: It lubricates the chain as it goes, so you don’t have to remember to do it. Chain Brake: Arguably, the most important safety feature. It stops the chain whenever it finds any sudden movements or rough impacts. Some models also have a manual brake. Low Kickback: A more balanced center of gravity reduces the chance of abrupt kickbacks and potential injuries. Light-Duty: For light cutting, trimming, and pruning. Go for an 8-inch to 16-inch bar. Medium-Duty: For small-sized tree removal. Look for bars between 16-inches to 18-inches. Heavy-Duty: For cutting medium trees down. The recommended range is between 18-inches to 20-inches. Professional: Ideal for firewood cutting and large hardwood trees. Bars between 20-inches to 24-inches fit in this top category. One last thing to consider is which type of environment you will most likely work at. If you’re a homeowner or a farmer, and most of the work you’ll be doing will be relatively close to a power outlet, you can go for a corded chainsaw. If you’re not dealing with huge amounts of wood, but they’re a scattered along a larger area, feel free to go for a battery-powered model. If you intend to work for longer shifts and relocate a lot while doing it, your only logical choice is a gas-powered device. Is the GreenWorks 20312 the Best Chainsaw for You? Thank-you for reading. We truly hope you found value in this article. We’ve been covering GreenWorks chainsaws since we started this website because they truly offer a lot of value in all of their products, not just chainsaws. Browse their product lineup and read the customer reviews on the various products to see what thousands of customers have to say. Their track record is undeniable. We’ve covered a wide range of topics here because we take a holistic approach at Chainsaw Journal and feel it’s essential to give you options to consider and knowledge to ponder. After all, everyone has different needs and there is no such thing as one chainsaw for everybody. The GreenWorks 20312 may be absolutely perfect for you but for someone who requires more power but still wants the convenience of a cordless chainsaw, well, then the GreenWorks 80V chainsaw is the smarter choice. On the other hand, someone who doesn’t have a lot of money and still needs a dependable chainsaw should probably buy the WORX WG303.1. Fast 30 minute charge for standard 80V 2 Ah battery (included). My point here is that only you can truly decide which chainsaw will fit your needs. We just want you to consider all of the factors before making a decision, including looking at other brands to compare. GreenWorks makes excellent chainsaws, no doubt about it, but they aren’t the only manufacturer worth considering. GreenWorks 40V and 80V Chainsaws or Best chainsaw for Cutting Firewood.